This second installment in OCEG’s Policy Management Illustrated Series addresses the need to track and evaluate changes in laws and regulations, business operations and strategies, and risk analysis that may each affect policy decisions. 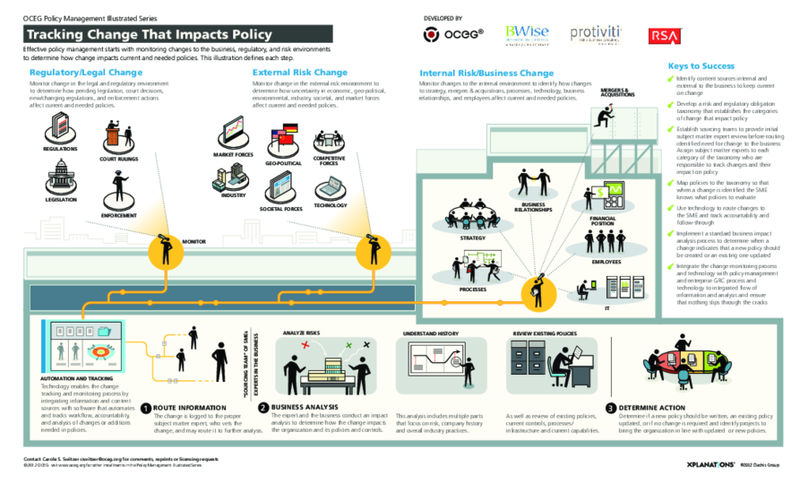 Effective policy management starts with monitoring changes to the business, regulatory, and risk environments to determine how change impacts current and needed policies. This illustration defines and illustrates each step. We have emailed instructions to access Illustration – Policy Series #2 – How Should We Track Changes to . Make sure the email arrives in your inbox: either add "support@oceg.org" as a safe sender to your email platform, or if you use Gmail, drag our email into your Primary tab.